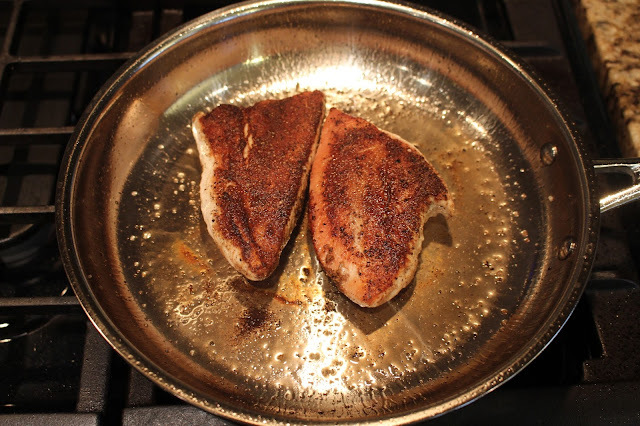 A Slice of Brie: Cooking Made Easy with Chef's Plate! This post was sponsored by Chef's Plate. Thank you for your support for the company's that make this hobby of mine possible. As always, all opinions and reviews expressed are my own. At the bottom of the post is a promo code for A Slice of Brie readers! 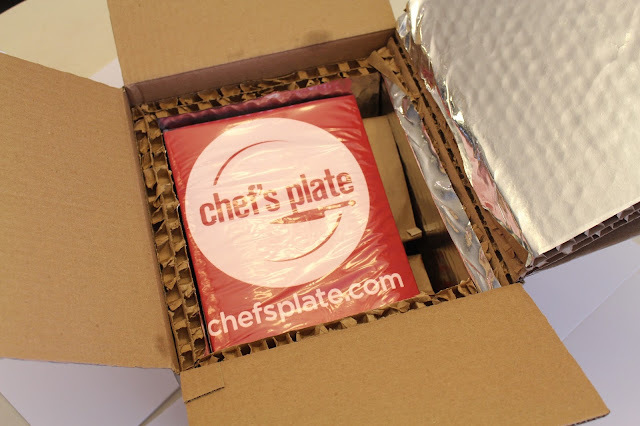 The other week, I finally got to try out Canada's new meal-delivery service, Chef's Plate. When I first caught wind that such a service was available in Canada, I knew immediately it was something I wanted to try. 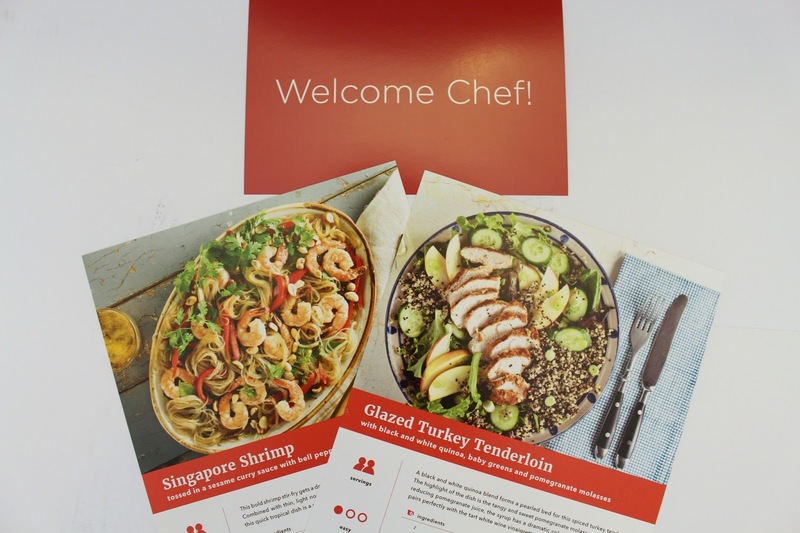 Fresh, locally sourced ingredients, delivered right to your door ready for you to cook up? Sign me up! Chef's Plate utilizes the freshest ingredients while sourcing and building relationships with local farmers in order to provide high quality and truly special meals. Because the exact amount of ingredients are sent to you to prepare your meal, waste is eliminated, and all ingredients are arrive fresher than you would find at the grocery store, and all meats are hormone and antibiotic free. A true foodie's dream all wrapped up in a refrigerated box that is sent right to your front door! Every week, a new menu is available to choose from on the Chef's Plate website, and you can choose from the 2-person plan, or the family plan. Each meal option gives you a description of the recipe, the ingredients you will be sent, as well as the difficulty level and the amount of time the recipe should take you to cook. 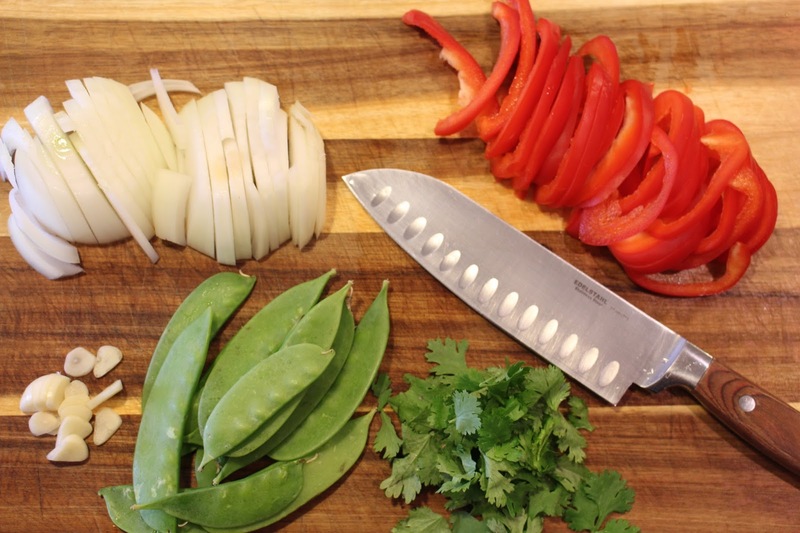 I decided to choose meals that utilized ingredients that I don't normally cook with. I love to cook, and I especially love trying new recipes, but sometimes buying a whole bunch of ingredients just to try something new is costly, wasteful and overwhelming. 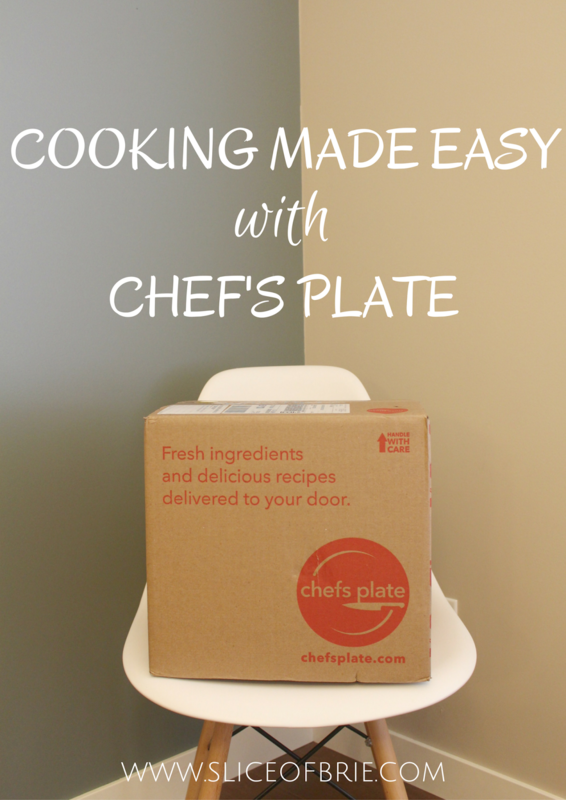 Chef's Plate solves that dilemma for you since you are only sent exactly what you need. The only things you are already required to have on hand are cooking oils and salt and pepper. 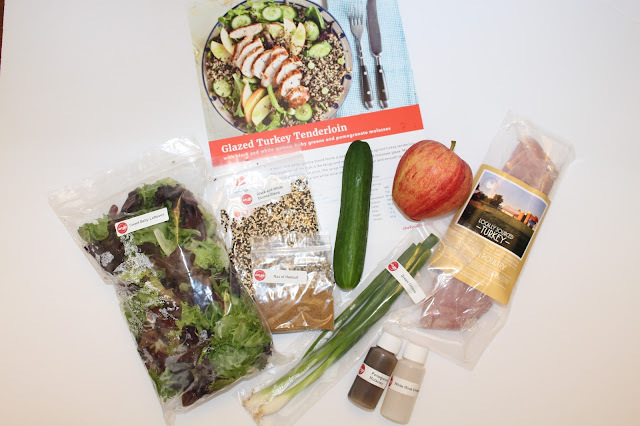 So with that in mind, I chose the Glazed Turkey Tenderloin with black and white quinoa, baby greens, and pomegranate molasses. For our second meal, I went with the Singapore Shrimp toasted in a sesame curry sauce with bell pepper and rice noodles. Once I placed my order, I was given a delivery date, and while the delivery time is quite open, you are able to attach specific instructions as needed. I made note that my box could be left on my front porch if I was not home to receive it, and it was. Since the box is refrigerated, it is safe for it to sit out for several hours. The other great thing about the box is all the packaging is completely recyclable, making for a truly waste free experience. The first night, I made the Glazed Turkey Tenderloin. I have never cooked turkey tenderloin before, but after that meal, I can tell you it won't be my last. This meal was so delicious that I still think about if from time to time. No leftovers were to be found and even my toddler enjoyed some of it (although I really didn't want to have to share!). On our second night, I cooked up the Singapore Shrimp. I've never cooked glass noodles before, and I don't think I would have ever had the courage to do so before this. 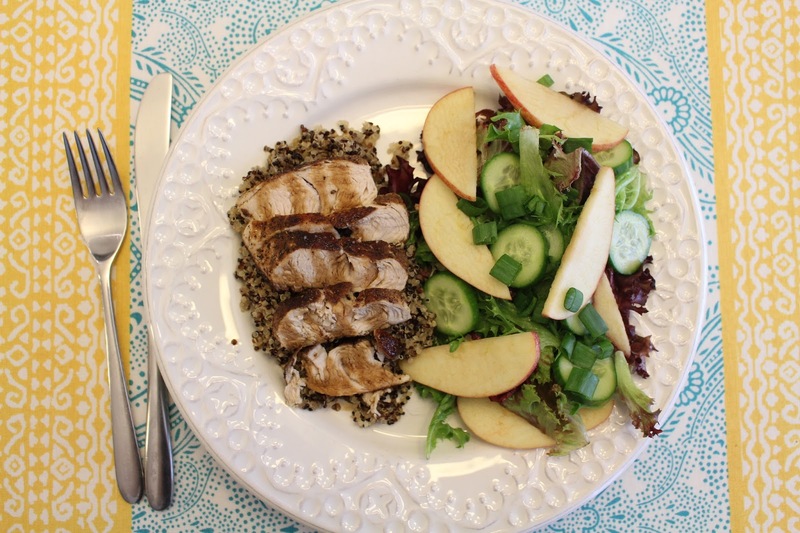 This meal also turned out great and was a big hit with all of us! Even though it was a meal for two, it fed all three of us and we even had leftovers for the next day. This recipe was a lot of fun because it was something different than I normally cook and felt like a meal we would usually only ever order out. Even though I cook frequently and try new recipes all the time, I still really appreciate step-by-step instructions. 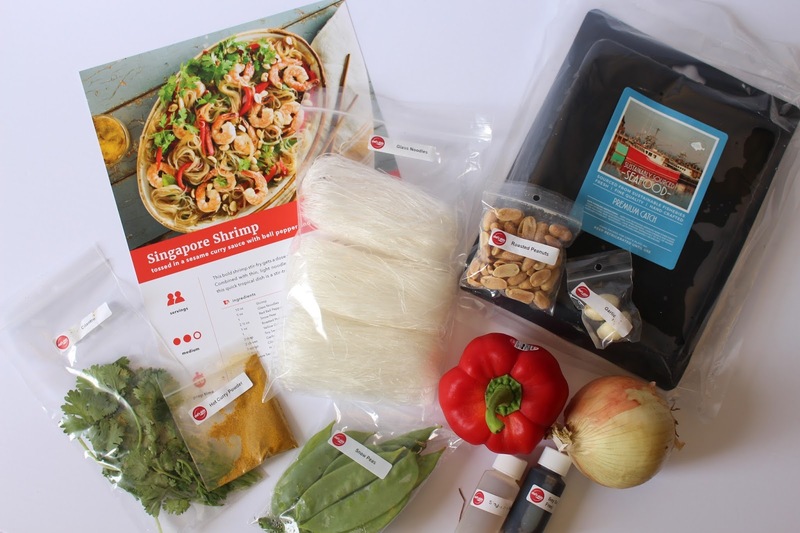 Along with your ingredients, you are also sent a photo of the meal you will be making which includes the ingredients, number of servings, difficulty level, prep time and nutritional break-down. On the back of the card there are step by step instructions including pictures. I loved this! I am such a visual person when it comes to cooking and this just made the whole process stress-free. The recipes even had a "chef's tip" at the bottom which I found very helpful too. And the neat part is, I can now replicate these recipes at home any time I wish since I have the instructions. Overall, I was so impressed with Chef's Plate. 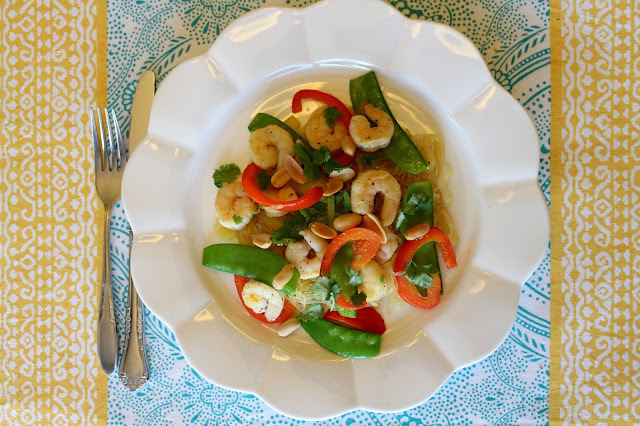 It was incredibly easy to order my meals, I was more than satisfied with the quality and freshness of the ingredients, and my meals actually turned out just like they look on the cards. I think it's so fantastic that a service like this is finally available in Canada. The average cost per person per meal is around $10-12 dollars, which, when you think about the cost of eating out, is very reasonable. I know I cannot take my family out to a restaurant for dinner for less than $30, and so often I leave disappointed. 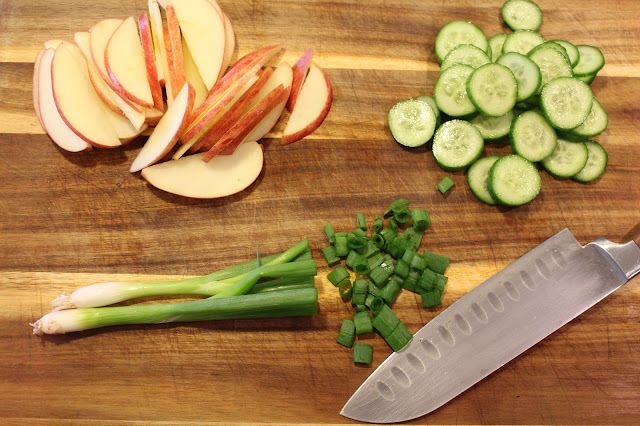 If you already love to cook, or if you are someone who wants to cook more often and aren't as brave in the kitchen, then this is a great option for you! I love that the guess work was taken out of it for me: how tiring is the old question "what should we have for dinner tonight"?! I think this is a fun way to make meal planning a little more exciting and easier. Or a great idea for a stay-in date night. Or even a thoughtful gift for someone! Really, I can't see anyone not enjoying this service. Have I convinced you to want to try this yet?! Honestly, this will not be the last time I order from Chef's Plate. Luckily for you, if you too want to try them out, you can use code #ASLICEOFBRIE to receive 3 free plate credits (that's a savings of $33!) . I promise, you won't be disappointed! Have you ever used a meal delivery service?